On May 18, 1978, Texas Sheriff John Quincey Wydell (William Forsythe), and a large posse of State Troopers issue an S and D mission on the Firefly family for over seventy-five homicides and disappearances over the past several years. They begin a full-scale attack when the Firefly family fires on them. During the firefight, the family kills four troopers and Tiny (Matthew McGrory) goes missing, Rufus (Tyler Mane) is killed, and Mother Firefly (Leslie Easterbrook, in a thankless role replacing the wonderful Karen Black) is taken into custody while Otis (Bill Moseley) and Baby (Sheri Moon Zombie, once again the star of the show) escape. Once out of their property, Baby pretends to be hurt in the middle of the road. When a nurse in travel stops to see what is the matter, Otis comes from behind and kills her with a knife. The two escape in her car and drive towards their specified meeting spot if all hell broke loose with the law at their home. They head to Kahiki Palms motel, a run down desert beaten place to seek refuge from the law and huge media coverage. While at the motel Baby seduces Roy, part of the Banjo and Sullivan singing group. While he is off guard due to Baby’s sexual innuendos, Otis sneaks up behind him, holds him at gun-point and demands he take them back to his room where the rest of the band is resting minus their roadie, who is at the gas station getting beef jerky. Otis and Baby takes the band hostage in the hotel room and Otis shoots Jimmy the roadie when he returns. Meanwhile, Baby’s father Captain Spaulding, after being alerted by Baby about the raid, hits the road to come to the hotel to meet Baby and Otis. His car runs out of gas and Spaulding assaults a woman and scares her son taking their car in the process. Back at the hotel, Otis sexually assaults Roy’s wife Gloria and Otis demands Adam and Roy to come with him on an errand. Otis drives his two prisoners to a place where he buried some guns. While walking to the location, the two prisoners put up a struggle and hit Otis in the head with a large tree branch. This knocks him down, but Otis soon regains control of the situation, shooting one of them and killing Roy while he is on the ground praying to God. Back at the motel, Adam’s wife Wendy tries to escape by going to the bathroom. Gloria attempts to rebel only to be killed by Baby. Wendy runs out of the motel only to be caught by Captain Spaulding who knocks her out. Otis returns, and all three leave the motel together in the band’s van. All hell is literally about to break loose. 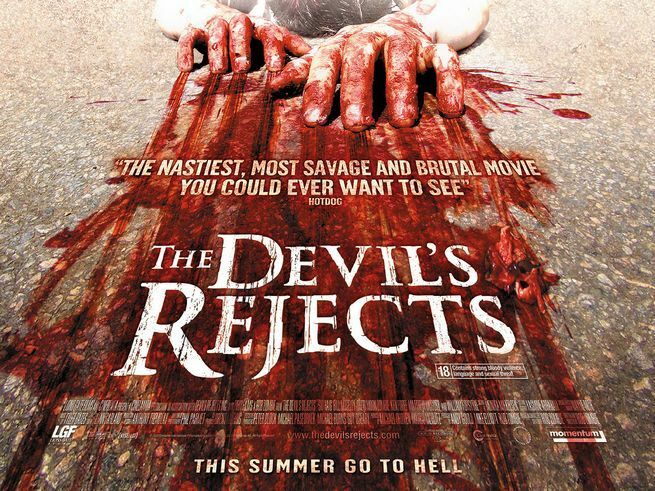 Going into the horror sequel “The Devil’s Rejects” I had no idea what to expect. Not really being a fan of Rob Zombie’s first film “House of a 1000 Corpses” I really wasn’t expecting much besides some cool deaths and a lot of gore. Well….I got that and a lot more. “The Devil’s Rejects” is repellent, evil, disgusting, disturbing, and, most shockingly, one of the best movies so far this year. Taking place mere days after the first flick, this movie has the Firefly family stalking another group of victims in a seedy hotel. Things don’t go as planned however when one of their original victim’s brother decides to get revenge. Words alone cannot describe what all happens on screen. Let’s see: A knife to the heart, bullets grazing flesh, a face peeling, a gutted, fully naked young woman, a bashed in head, pieces of a young girl strung along a highway. This is S & M for horror fans. This isn’t for all tastes but if you miss the old school horror days of “Last House on the Left” and “Texas Chainsaw Massacre”, you won’t be disappointed.